Happy New Year! Exciting news for 2019! Due to the success of our ticket sales for our limited run at Theatre Horizon, we have added an additional show! 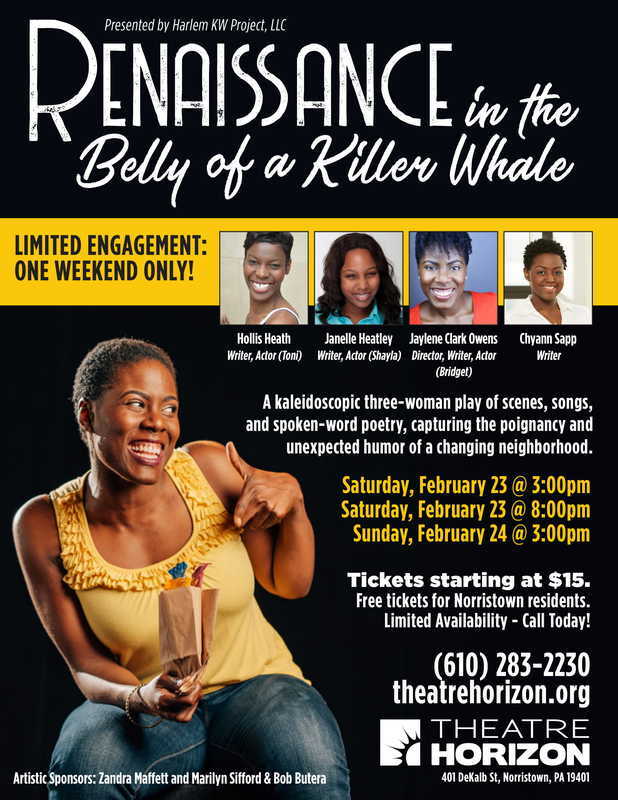 We will now be performing Renaissance in the Belly of a Killer Whale on Friday, February 22, at 8PM, Saturday, February 23 at 3PM and 8PM, and then on Sunday, February 24 at 3PM. Get your tickets here before they sell out! ​Theatre Horizon is located at 401 DeKalb Street, Norristown, PA 19401, about 30 minutes outside of Philadelphia, PA. Exciting news! 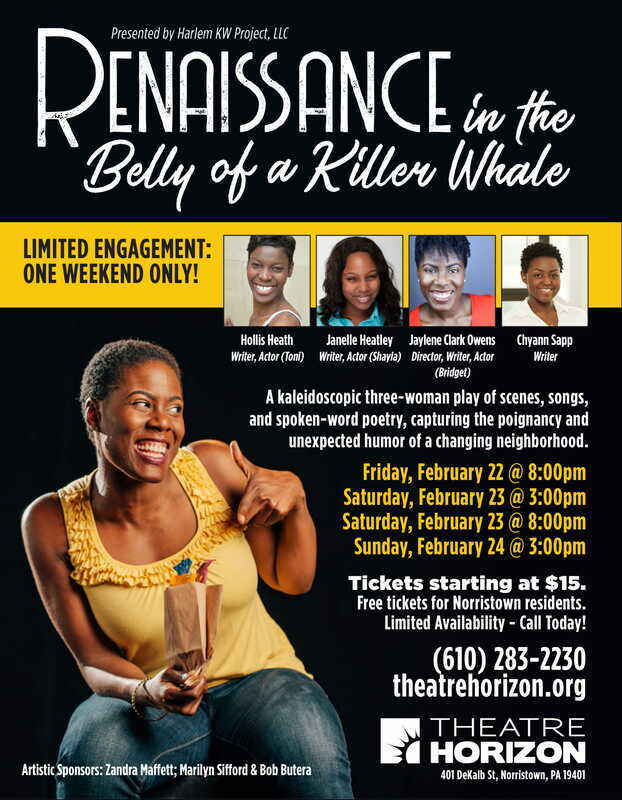 Renaissance in the Belly of a Killer Whale will be joining the 2018-19 Season at Theatre Horizon in Norristown, PA! Our Executive Director, Jaylene Clark Owens, has become a Theatre Horizon favorite, being featured in two productions at the theatre: WHITE by James Ijames and The Revolutionists by Lauren Gunderson. Theatre Horizon has announced its 2018-19 season, and promises that it will be its biggest yet. “By doubling the number of events in our year, next season propels us toward our goal of including a wider range of voices in our art, so we can provide unexpected encounters and build bridges,” said Artistic Director, Erin Reilly, said in a statement. Killer Whale will be one of those events! Learn more here (American Theatre Magazine) and here (BroadwayWorld.com)! We'll be performing on Saturday, February 23, 2019, at 3PM and 8PM, and then on Sunday, February 24, 2019, at 3PM. Stay tuned for more information on when tickets go on sale! Theatre Horizon is located at 401 DeKalb Street, Norristown, PA, located about 30 minutes outside of Philadelphia, PA.
We will be doing a private performance at Success Academy Harlem North Central at the end of March! 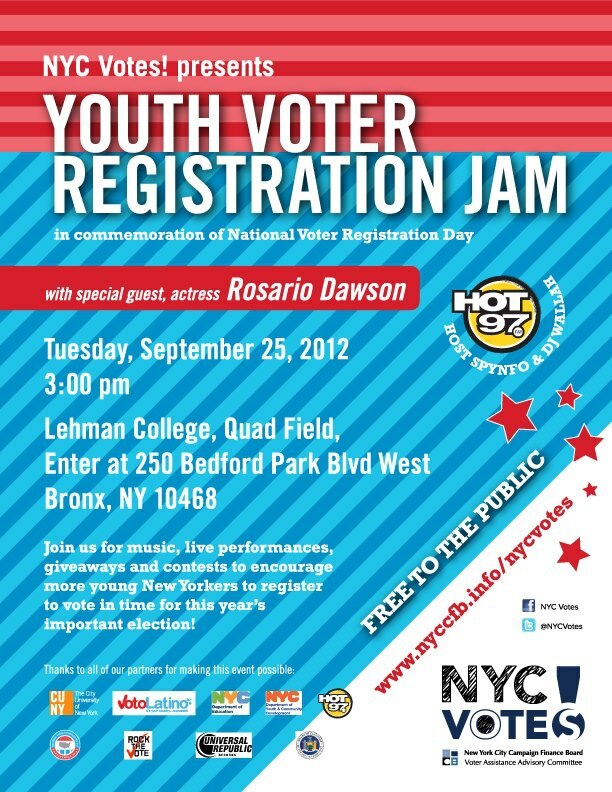 We are so excited to perform for the young people in our home of Harlem!! 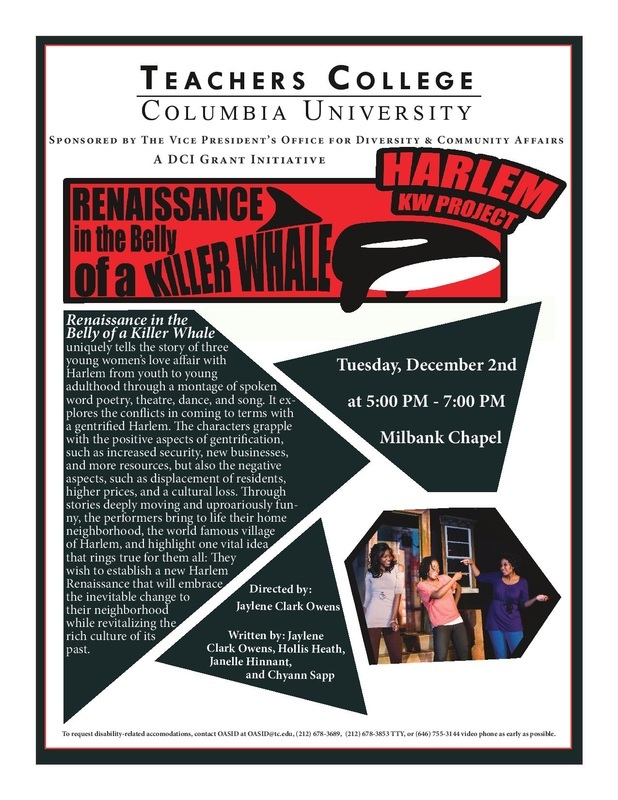 We are back with another FREE performance...this time as part of our Harlem Killer Whale College Tour! On Friday, December 1, at 6:30PM, the Peace Corps Fellows Program at Teachers College, Columbia University will present "Renaissance in the Belly of a Killer Whale!" The show will take place in the Joyce Cowin Conference Center, located at 525 West 120th Street. We will be selling our "SoHa" shirts following the performance. It is recommended that you arrive 10-15 minutes early for seating. 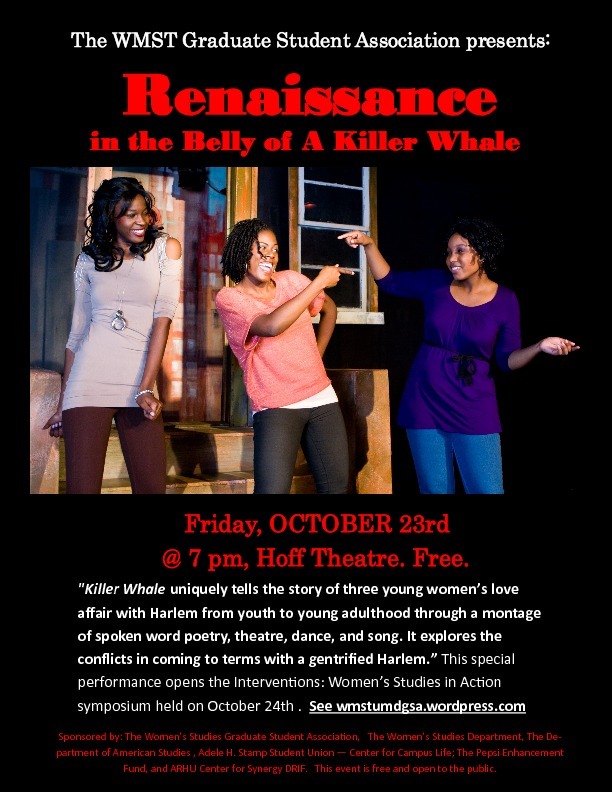 We are so excited to perform two FREE performances of Renaissance in the Belly of a Killer Whale for the Harlem community! On Saturday, September 16, at 1PM and 7PM, our show will be free and open to the public as part of Open House Weekend at the Harlem School of the Arts! Although tickets are free, we are asking that you RSVP for the 7PM show by visiting our Tickets page. Our 1PM will be seated on a First Come, First Serve basis so please arrive early for a seat! All guests with RSVPs for our 7PM show must arrive at least 15 minutes before the start of the show. After this time, guests on the waiting list, and walk-ins, will be seated. HSA is located at 645 Saint Nicholas Avenue, New York, NY, between 141st and 145th Streets. The performance will take place in the theatre, which is a few feet down from the main entrance of HSA. Look for the light blue door! Our Executive Director, Jaylene, will appear on ABC New York's "Here and Now" program with Sandra Bookman on September 10th at noon! "Here and Now" is a weekly program dedicated to covering the issues and interests of the African-American community in the NY tri-state area. Sandra interviews Jaylene, and Artistic Director of Harlem School of the Arts, Alfred Preisser, about Killer Whale and our September performance at HSA! Alfred was the one who first reached out to Jaylene to write Killer Whale after reading a Facebook status she posted and has since then supported the play in every step of its journey. To learn more about how the show began, visit our Bio page! Be sure to set a reminder for September 10 to catch the interview! An EXTREMELY limited number of RED SoHa shirts will be on sale at our September 16 performances at Harlem School of the Arts! Our black shirts sold out at our July performances and there will be even fewer of the red shirts available! We will have our white shirts, newly stocked black shirts, and new red shirts available for sale both before and after our 1PM and 7PM shows. Shirts are $20. We will have Unisex and Womens shirts in sizes ranging from Small to 3XL. Black and red shirts will be available in sixes Small to XL. We now have a Limited Edition Black SoHa shirt! We will be selling these, along with our classic white ones, ​between 6PM and 7PM or 8:30PM and 9PM on Friday, July 7 or Saturday, July 8. Shirts are $20, but if you purchase a ticket to the show, you can get one for $15! ​We will have Unisex and Womens shirts in sizes ranging from Small to 3XL. The Limited Edition shirts only come in sizes Small to XL. We are returning to the Harlem School of the Arts (HSA) for two special summer performances of Renaissance in the Belly of a Killer Whale! The shows will take place on Friday, July 7 and Saturday, July 8, both at 7PM. Tickets can be purchased online by visiting our Tickets page, or in person one hour before the show. Tickets are $20 General Admission and $15 for Students and Seniors. HSA is located at 645 Saint Nicholas Avenue, New York, NY, between 141st and 145th Streets. The performance will take place in the theatre, which is a few feet down from the main entrance of HSA. Look for the light blue door! Our SoHa t-shirts are back in stock and will be sold at our upcoming performances at the Harlem School of the Arts! Stop by the theatre between 6PM and 7PM or 8:30PM and 9PM on Friday, July 7 or Saturday, July 8 to purchase your shirt! Shirts are $20, but if you purchase a ticket to the show, you can get one for $15! ​We will have Unisex and Womens shirts in sizes ranging from Small to 3XL. 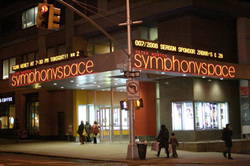 Tickets to our return performance at the famed Harlem School of the Arts (HSA) on are ON SALE NOW! The show will take place in the HSA Theatre on Friday, February 10 and Saturday, February 11, both at 7PM. General Admission tickets are $20, Students & Senior Citizen tickets are $15. HSA is located at 645 St. Nicholas Avenue (at 141st street) in Harlem. Nearby trains are the A,B,C,D to 145th street. Join us for a night of spoken word poetry, theater, song, and more. These performances will mark our second time performing at HSA where our very own Jaylene Clark Owens and Janelle Heatley are both graduates of the famed performing arts institution. The show will be a great idea for a Valetine's Day weekend date! Get your tickets now! Spread the word! We hope to see you there! We are officially sold out for our performance at Big Belly Roti Shop on Saturday, December 3rd! Thank you to all those who purchased tickets. We are so excited to see you this weekend! 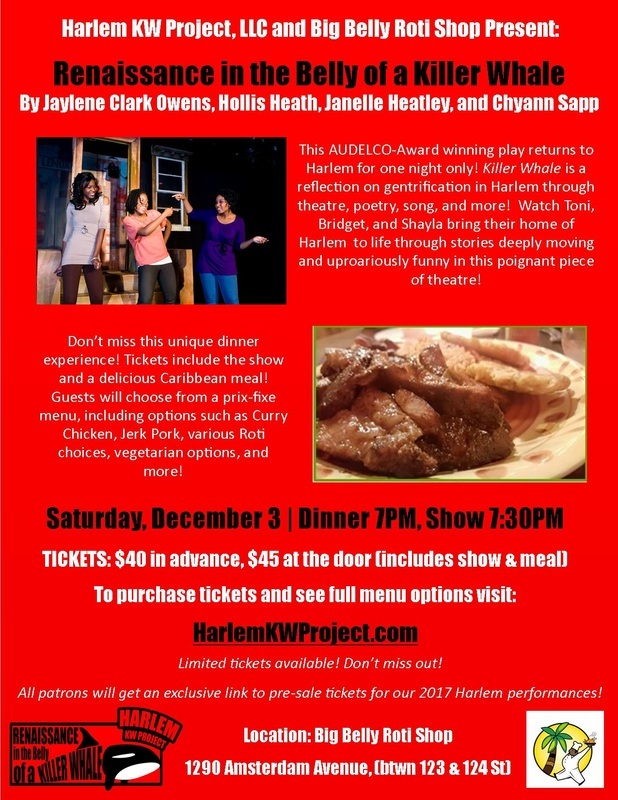 We are returning to Harlem for our second dinner theatre experience! In 2011 we performed at Londel's Supper Club. This year we will perform at the recently opened Caribbean restaurant in Harlem, Big Belly Roti Shop! 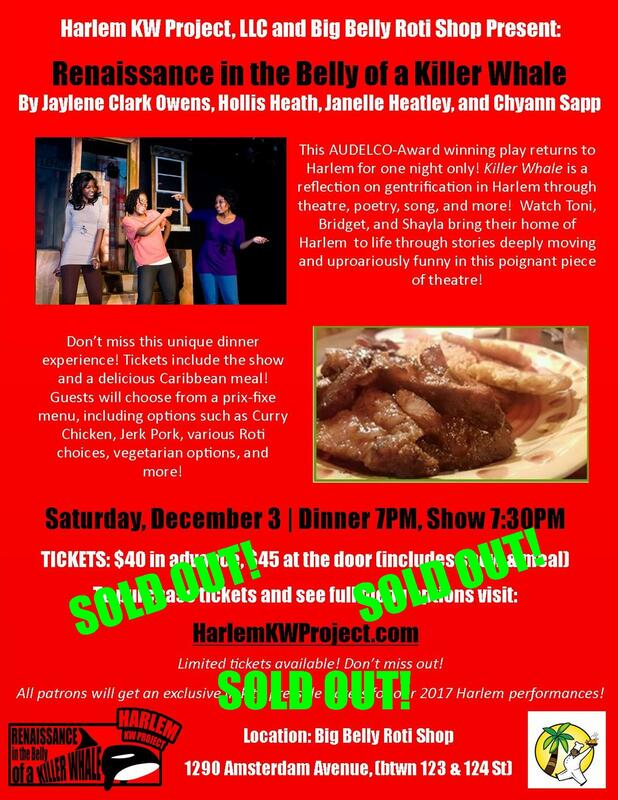 On Saturday, December 3, join us for a delicious Caribbean meal and a performance of Renaissance in the Belly of a Killer Whale! Dinner starts at 7PM and the show will begin at 7:30PM. Guests will get to choose from a prix-fixe menu that will include options such as Curry Chicken, Jerk Pork, various Roti choices, vegetarian options, and more! Tickets are $40 in advance and $45 at the door. Tickets are very limited! Visit our Tickets page to purchase yours today and view the complete menu options for the evening. Don't miss Renaissance in the Belly at Big Belly! Join us this Friday, November 4 at 7:30pm as our Executive Director, Jaylene Clark Owens, performs "SOHA," a select poem from Killer Whale, at the Harlem Stage event, "What is the Soundtrack to Harlem's Future?" The event will be an interactive evening of dynamic dialogue, performance and engagement. 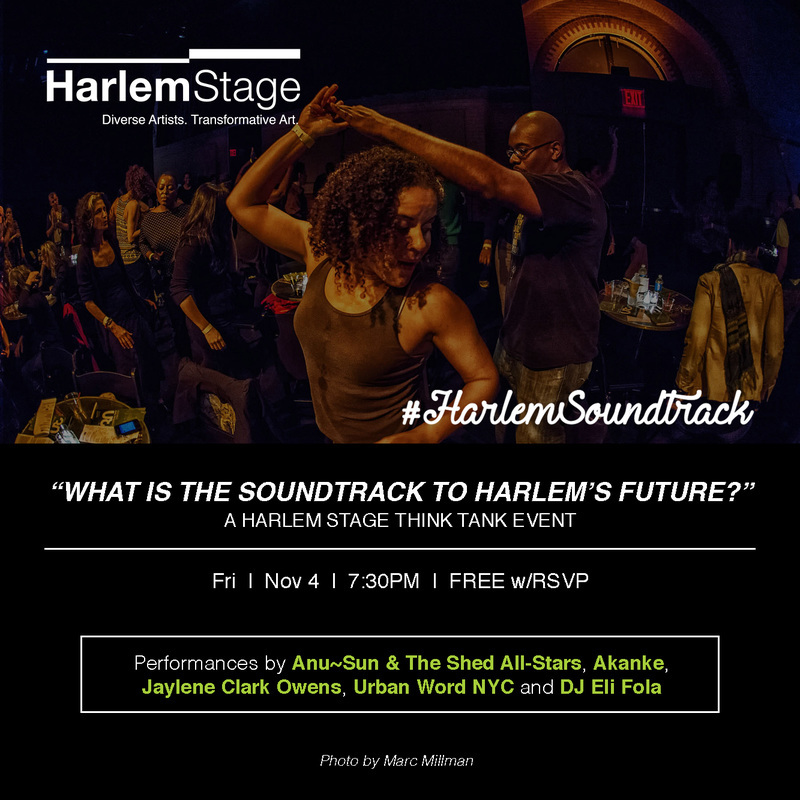 Harlem Stage will explore community, music, gentrification and the future of Harlem as the inaugural cohort of the Harlem Stage Think Tank presents their creative responses to the question “What is the Soundtrack to Harlem's Future?" The event is FREE and open to the public and will be held at the Harlem Stage Gatehouse located at 150 Convent Avenue (at west 135th street). In addition to a performance by Jaylene, it will feature live music performances by Anu~Sun & The Shed All-Stars, a DJ dance party with DJ Eli Fola, Live visual art by Emuche Nwaigwe, spoken word performances by Rhonda “Akanke” McLean-Nur and Urban Word NYC, a specialty menu of light bites and beverages for sale courtesy of Home Sweet Harlem, and an exciting soundtrack provided by YOU! To RSVP CLICK HERE. If you're a Harlem resident, artist, scholar, activist, or just someone interested in Harlem…come out for this house party! At the 8:57 mark of this video, First Lady Michelle Obama mentions Hollis in her commencement speech at the City College of New York in Harlem! She says, "...the educational theatre student, from right here in Harlem, who is already an award winning playwright, and who recently spoke at the White House!" 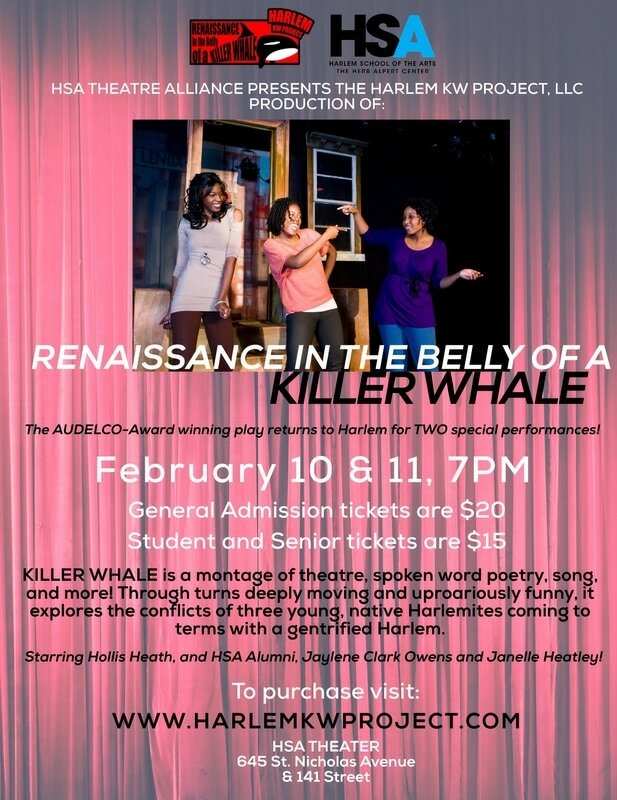 The award winning play that Hollis is credited for is, of course, Renaissance in the Belly of a Killer Whale! 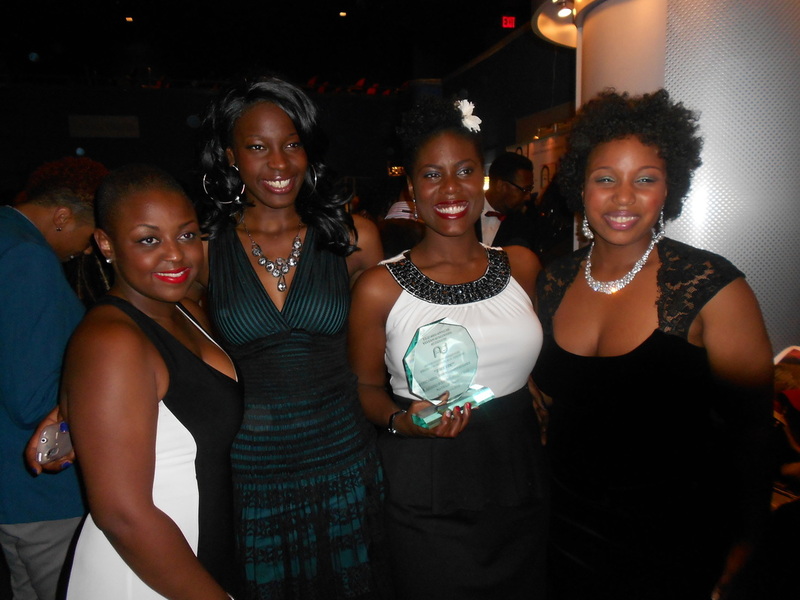 We won an AUDELCO-award in 2012 for Outstanding Ensemble Performance. Hollis spoke at the White House on March 25 of this year as part of the United State of Young Women Forum. Go, Hollis, go! Hollis was featured in this NBC News article about Michelle Obama's final commencement speech, which she delivered in Harlem at the City College of New York on June 3rd! The article talks about all the important work Hollis is doing with young girls throughout the city. It even mentions Renaissance in the Belly of a Killer Whale! 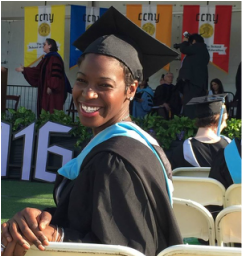 We are so proud of Hollis and Janelle, who both received their Masters of Science in Education from City College! Read more here. We are returning to Teachers College Columbia University for the fourth time and we are just as excited as the first! We always look forward to these performances because we perform for students who are currently teachers and educational professionals in New York City. The talkbacks are always stimulating and we can see first hand how our play impacts the minds of these students, thus impacting the students they interact with, and thus impacting the community. The performance will take place on July 8th. This show is not open to the public. Chyann was featured in this NY Times article titled, "Priced Out of a Childhood Home," about how gentrification has caused many to move out of their childhood neighborhoods because the cost of living is too expensive. Read more here! The Harlem Killer Whale College Tour is headed to Mohawk Valley Community College! Catch a free performance of Renaissance in the Belly of a Killer Whale on Wednesday, April 27, at 12PM in the Dr. Michael I. Schafer Theater, located inside the Information Technology Building, on the Mohawk campus, at 1101 Sherman Dr, Utica, NY! A killer whale in the White House! 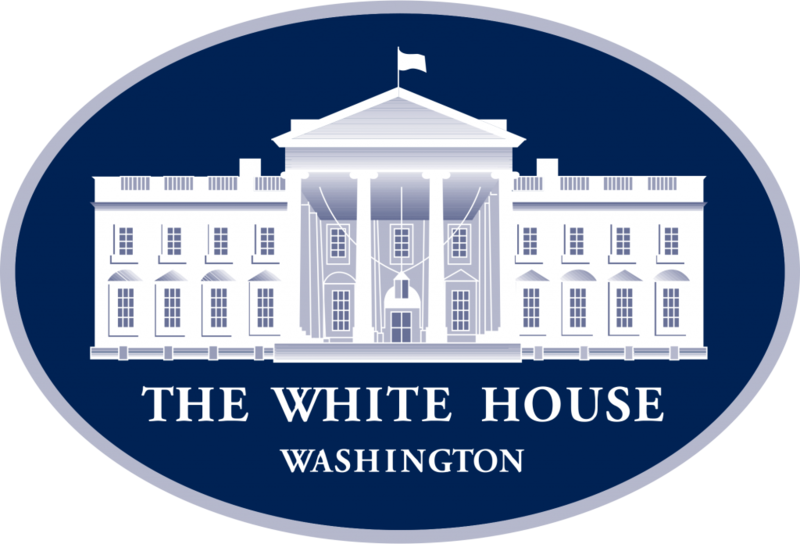 Our very own, Hollis Heath, who plays Toni and serves as Associate Director of Harlem KW Project, LLC, will be speaking at the White House today! She was invited to The White House United State of Young Women Forum where she will speak about how the arts are a vehicle for the voice and visibility of young girls and how this leads to them transforming their communities. We are so proud of Hollis! Tune in for the live stream TODAY at 3:30PM! Watch it here! We are extending our Harlem Killer Whale College Tour stop in North Carolina with a performance of Renaissance in the Belly of a Killer Whale at Duke University! Delta Sigma Theta Sorority, Inc. will be presenting our show on Sunday, April 3, at 7PM in East Duke 209! This performance is free and open to the public! Please spread the word to your North Carolina friends! On Friday, April 1 and Saturday, April 2, we will also give two free performances at the University of North Carolina at Chapel Hill. See the February 10th News announcement below for more details! The Harlem Killer Whale College Tour continues with a performance of Renaissance in the Belly of a Killer Whale at the Georgia Institute of Technology, also known as Georgia Tech! 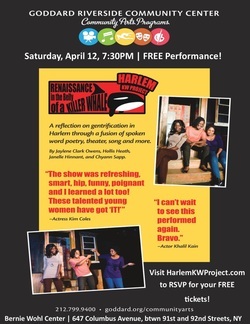 The ladies of Harlem KW Project, LLC will perform at the Ferst Center for the Arts on Sunday, April 24, at 3PM. Tickets are $20 and can be purchased here. The Ferst Center is located at 349 Ferst Dr NW, Atlanta, GA. Please spread the word to your Atlanta friends! This April, Harlem KW Project, LLC will be traveling to North Carolina to participate in the inaugural Telling Our Stories of Home Festival at the University of North Carolina at Chapel Hill as part of the Harlem Killer Whale College Tour! 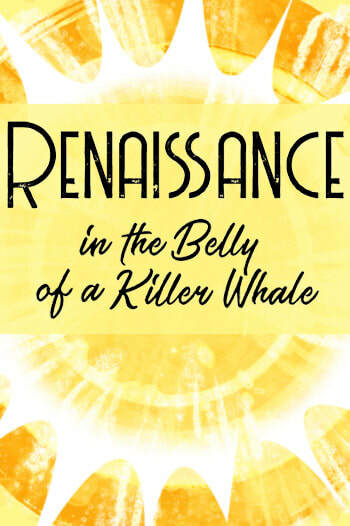 Renaissance in the Belly of a Killer Whale will be performed on Friday, April 1, at 7PM and Saturday, April 2, at 7PM. Both performances will take place at the Sonja Haynes Stone Center, located at 150 South Rd, Chapel Hill, NC. All performances are free and open to the public! Unfortunately, Jaylene will not be able to make the trip because she is cast in a show in Philly (details coming soon! ), but her role of Bridget will be understudied by La Tasha Stephens. ​"The 6-day conference-festival (spread over two weekends), will bring together outstanding national and international faculty, activists, and performers to offer critical and artistic approaches through a series of workshops, presentations, films, and performances to engage in public and feminist discourses on home. This conference festival provides a platform for women in Africa and its diaspora to share stories across national boundaries. The ability to bring women from Africa, the Americas, and Asia—a site seldom included in African diaspora studies—is an opportunity for UNC-CH and the state of North Carolina to foster change across the globe." To learn more about this exciting festival , click here. On Monday, February 29, Killer Whale will be returning to MƒA, formally known as Math for America for a special performance for the program's teachers! MƒA is a private nonprofit organization with a mission to improve math and science education in secondary public schools in the United States by recruiting, training, and retaining outstanding mathematics and science teachers. This performance is not open to the public. 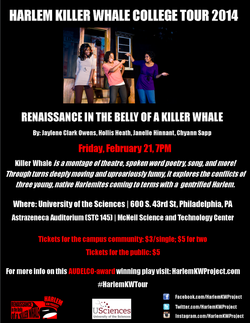 The ladies of Harlem KW Project, LLC are ecstatic to return to Ithaca College, to perform Renaissance in the Belly of a Killer Whale for the second time on campus! Ithaca College is the alma mater of our Executive Director, Jaylene Clark, and she is thrilled to bring the show back to her school! The performance will take place on Monday, February 15, at 7PM, as part of the Center for the Study of Culture, Race, and Ethnicity(CSCRE) Discussion Series. This series brings several speakers, artists, and performers to Ithaca each year with the goal of fostering critical dialogues on race . The focus of CSCRE is to "help students develop a comprehensive understanding of the multiracial and polycultural world in which we live." The performance is FREE and open to the public! It will take place in the Klingenstein Lounge, located inside of the Campus Center at Ithaca College, 953 Danby Road, Ithaca, NYC. Calling all performing artists! 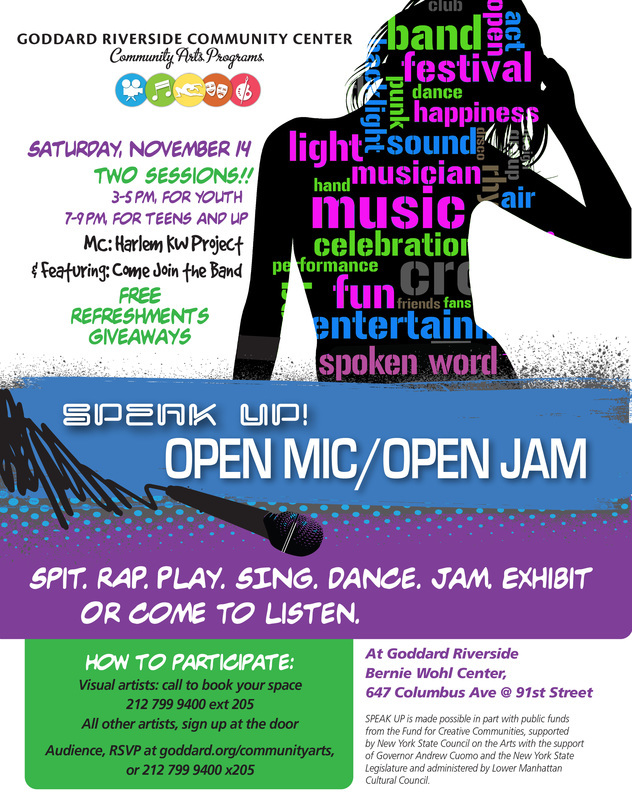 Join us this Saturday, November 14th as we host TWO open mic sessions at the Goddard Riverside's Bernie Wohl Center in Manhattan, located at 647 Columbus Avenue, between 91st and 92nd Streets. This is a FREE event and there will be refreshments and giveaways! Spit. Rap. Play. Sing. Dance. Jam. Exhibit your work. Come out to share your work and to hear other artists express their creativity with rap, spoken word, dance, and singing performances! Visual artists are also welcome to display their work. As a new feature, the first open mic will be open to younger performers to give them a chance to participate. The 3-5pm session will be open to youth ages 14 and younger and will feature a special performance from the amazing after school program, Come Join the Band!This session is great for teachers, parents, or educators interested in bringing youth to an artistic event. You can RSVP HERE. The 7-9pm session will be open to adult performers (teens welcome). Everyone can RSVP HERE. Performers can sign up for the open mic when they arrive and all visual artists interested in displaying artwork can call 212-799-9400, ext. 205, to reserve the space to display their artwork. Please note that both events are family friendly audiences, so we ask that the performers not use any sexually explicit, crude, or disrespectful language in your work. We are excited to announce that on Friday, October 23rd, 7PM, KILLER WHALE will be performing at the University of Maryland College Park for the Department of Women's Studies second biennial symposium! Our performance will kick off the event entitled "Interventions: Women's Studies in Action." The performance is FREE and open to the public. The performance will be on Friday at 7pm and will be held in the Adele H. Stamp Student Union, Hoff Theatre located at 1021A Union Lane, College Park, MD. The symposium takes place on Saturday, October 24, and has a variety of sessions, panels, and discussions happening throughout the day. The ladies of Killer Whale will be featured on the panel entitled, "Intervention: A Dialogue on Art and Social Justice in Communities of Color," at 3:45PM in Skinner Lecture Hall (0200), located on Chapel Drive, College Park, MD. For the full schedule click here. We invite our supporters from the DMV area to come out for a night of poetry, theatre, dance, and song! Please spread the word and we hope to see you there! We are excited to announce that KILLER WHALE is back for a special return performance at the Goddard Riverside Community Center! We invite you to join us on Saturday, September 12, 2015 at 7:30PM. General Admission is $15, and Students & Seniors are $10. The performance will be held at the Bernie Wohl Center at Goddard Riverside Community Center, 647 Columbus Avenue (between 91st and 92nd streets). To purchase tickets visit our Tickets page or click the button below! Due to the inclement weather, the Harlem Killer Whale College Tour performance at the University of Iowa has been postponed. It has be rescheduled for Monday, April 27, at 6PM.This performance is FREE and open to the public! Please note that the venue has changed. The performance is no longer taking place at the library. It will now take place in Iowa Memorial Union, Illinois Room 348, located at 125 North Madison Street, Iowa City, IA. New stop added on our Harlem Killer Whale College Tour! We will be headed to Baltimore to visit Johns Hopkins University on Saturday, February 28, 7PM! This performance is free and only open to the Johns Hopkins community. Please spread the word to your JHU friends! We have the honor of performing for the teachers at M¦A, formally known as Math for America, on Friday, March 4th! M¦A is a private nonprofit organization with a mission to improve math education in secondary public schools in the United States by recruiting, training, and retaining outstanding mathematics and science teachers. This performance is not open to the public. 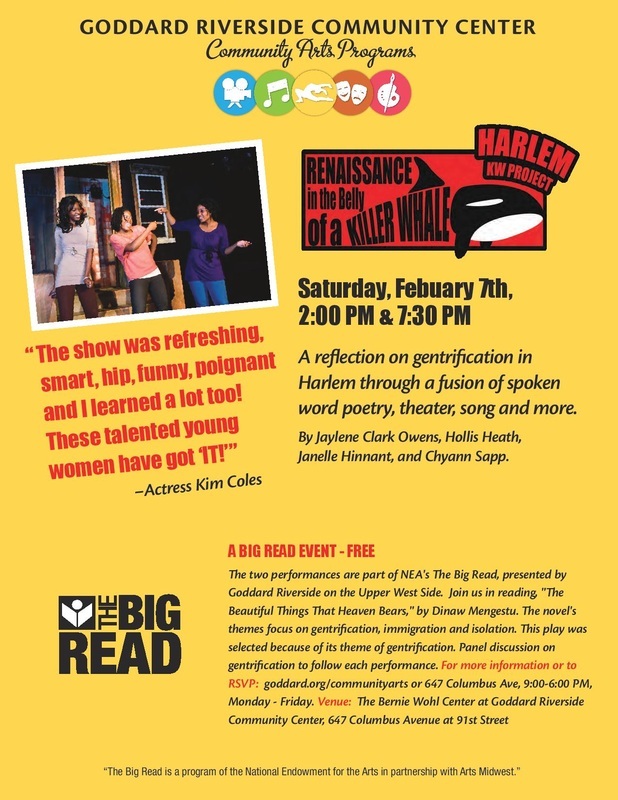 We are returning to the Goddard Riverside Community Center for 2 FREE performances on Saturday, February 7, at 2:00PM and 7:30PM, as part of The Big Read initiative. To reserve your free tickets click here. The Big Read is a program of the National Endowment for the Arts (NEA) designed to restore reading to the center of American culture. Managed by Arts Midwest, The Big Read provides competitive grants to support innovative reading programs in selected communities. Through The Big Read, selected communities come together to read, discuss, and celebrate one of 37 selections from U.S. and world literature. To learn more about the program click here and join us at their kickoff event on Saturday, January 24th! We are returning to Iowa City, Iowa for an encore performance at the University of Iowa as part of our Harlem Killer Whale College Tour! The show is free and open to public. It will be on Monday, March 2, 7PM at the Iowa City Public Library, which is located at 123 South Linn Street, Iowa City, IA. 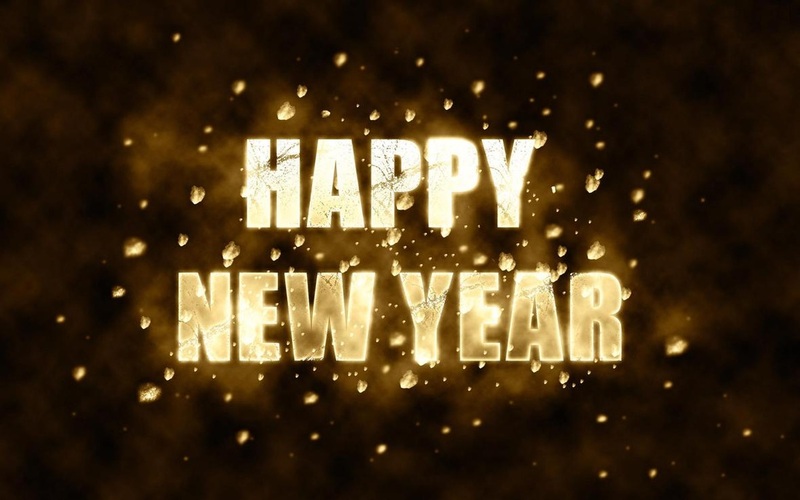 Happy New Year to all of our supporters! We had an amazing 2014 and are looking forward to all the new things that 2015 will bring! The Harlem Killer Whale College Tour will be back in 2015! We'll kick things off during Black History Month with a performance at New York City College of Technology, aka City Tech. The show will be held on Thursday, February 26, at 1PM. This free performance is currently only open to the City Tech community. We are continuing our 2014-2015 Harlem Killer Whale College Tour with an encore performance at Teachers College Columbia University! The performance will be held on Tuesday, December 2, at 5PM at Columbia's Milbank Chapel (525 West 120th Street, between Amsterdam and Broadway Avenues). The show is FREE and open to the PUBLIC so mark your calendars and arrive early to get your seats! 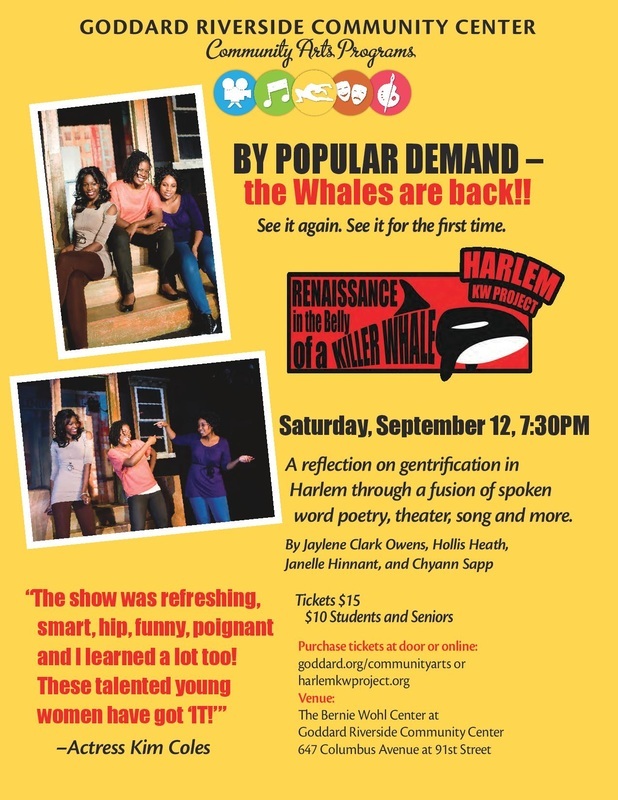 Renaissance in the Belly of a Killer Whale is coming full circle with 2 special performances at the Harlem School of the Arts (HSA)! Catch Killer Whale on Friday, October 17, 7PM and Saturday, October 18, 7PM, in the HSA Theatre. This is a very special performance for us because Killer Whale would not exist if it were not for HSA. Jaylene met both Alfred and Janelle at HSA 10 years ago. Alfred Preisser is responsible for giving Jaylene the opportunity to write Killer Whale after seeing a Facebook status she posted in 2010. To learn more about how HSA plays into the history of Killer Whale, visit our Bio section! Tickets are $20 for general admission and $15 for groups of 10 or more. HSA is located at 645 Saint Nicholas Avenue, New York. To purchase tickets click here. The Harlem Killer Whale College Tour has returned for the 2014-2015 school year! The first stop on the tour is Canton, NY! We'll be performing Killer Whale on Friday, September 12, 8PM, at SUNY Canton. This performance will take place in the Kingston Theater, which is located in the Miller Campus Center. The next day,﻿ Saturday, September 13, at 5PM﻿, we are excited to return to the neighboring school,St. Lawrence University, and perform in the Bloomer Auditorium. Both performances are FREE and open to the public! Harlem KW Project, LLC is returning to the famous Martha's Vineyard on Thursday, July 31st, 7PM, as part of the Tenth Annual African American Cultural Festival. The performance will be held at Union Chapel, 55 Narragansett Avenue, Oak Bluffs, MA and it is open to the public. Tickets are $15. This event is sponsored by The Cottagers, Inc. of Martha’s Vineyard (the Cottagers). This is a philanthropic organization of African-American women homeowners on Martha's Vineyard. Founded in the mid-1950s primarily by members of the summer community, it is dedicated to giving monetary assistance to various island causes as well as annual scholarships to two MV Regional High School graduating seniors. 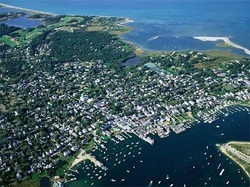 We encourage you to take a getaway and join us at Martha's Vineyard! 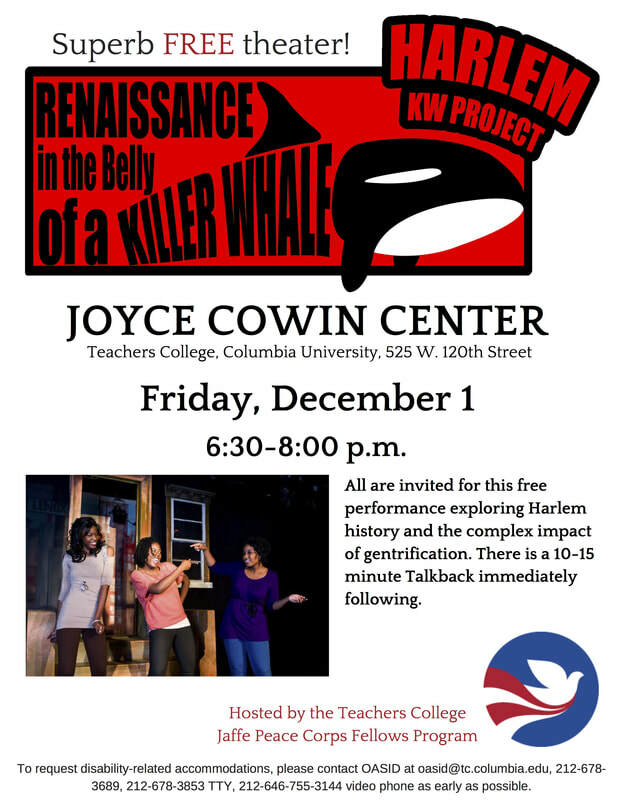 The Harlem Killer Whale College Tour continues with a performance at Teachers College Columbia University! On Monday, June 30, we will perform Killer Whale for the graduate students in the "Team and Organization Behavior" class, taught by Suzanne Carothers and Yolanda Sealey-Ruiz. The course "examines how topics in diversity inform the decisions of instructional leaders." By exploring issues of diversity, cultural and otherwise, it sheds light on how "the role of leadership can be used to guide instruction by creating learning environments which ensure that all students have sufficient opportunities to achieve." We are very excited to interact with these future leaders who are learning in Harlem and will most likely find jobs within the Harlem community. 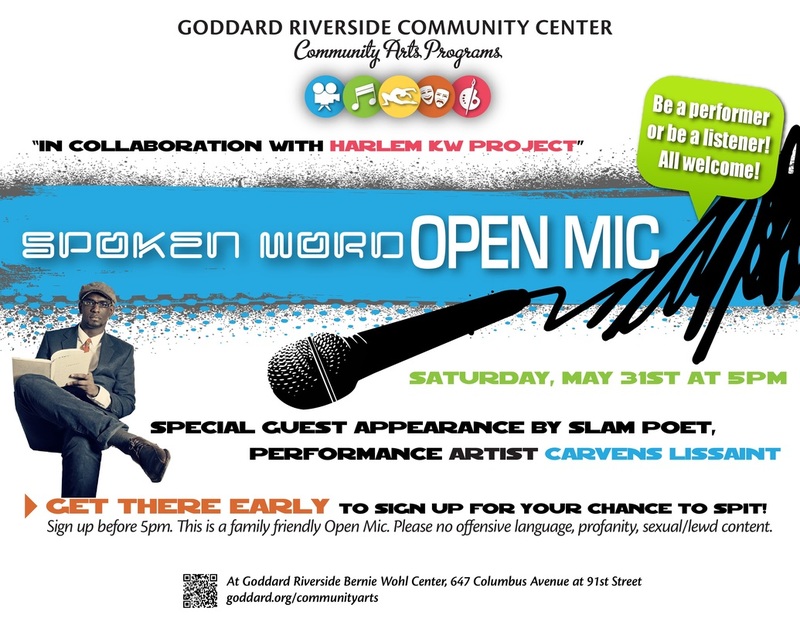 We are continuing our partnership with the Goddard Riverside Community Center by hosting an Open Mic featuring Poetry Slam Champion, Carvens Lissaint, on ﻿Saturday, May 31, at 5PM﻿. The event will be held at the Bernie Wohl Center at 647 Columbus Avenue, between 91st and 92nd streets. This is a FREE event! Arrive early to sign up for your chance to spit a poem! This is a family friendly open mic so please no offensive language, profanity, or sexual/lewd content. A spoken word open mic is an event in which audience members sign up when they arrive for their chance to perform a poem. This is not a themed open mic so performers are able to share what's on their heart. Poems do not have to be memorized, so feel free to read from a paper, your phone, or straight out of your notebook! You may ask, "What if I don't want to perform a poem??" No problem! You can also come to the open mic just to listen to some of the amazing poetry that will be shared. 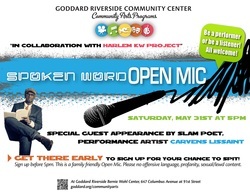 Harlem KW Project, LLC will be hosting the event, and will even bless the mic with a performance or two. The evening will begin with the open mic and end with a spectacular poetry set from Carvens Lissaint! To learn more about Carvens click here and click here to view some of his poetry videos! 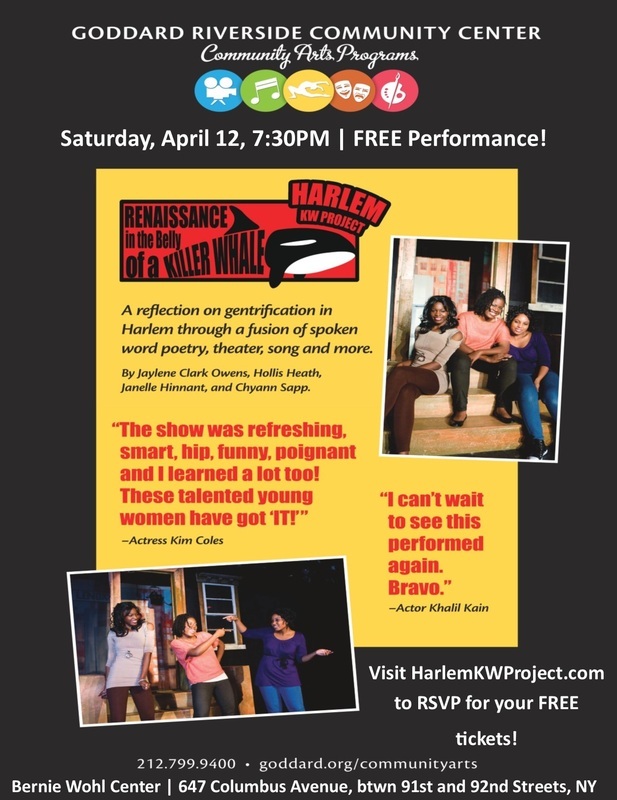 Harlem KW Project, LLC will be partnering with the Goddard Riverside Community Center (GRCC) to present Renaissance in the Belly of a Killer Whale at the Bernie Wohl Center on Saturday, April 12, at 7:30PM. This performance is FREE and open to the public, but reservations must be made by clicking here. The GRCC is "one of New York City’s leading human service organizations. We work to meet people’s basic needs – food, shelter, education – and to bring them together for mutual aid, social action, and to celebrate our richness as a society. 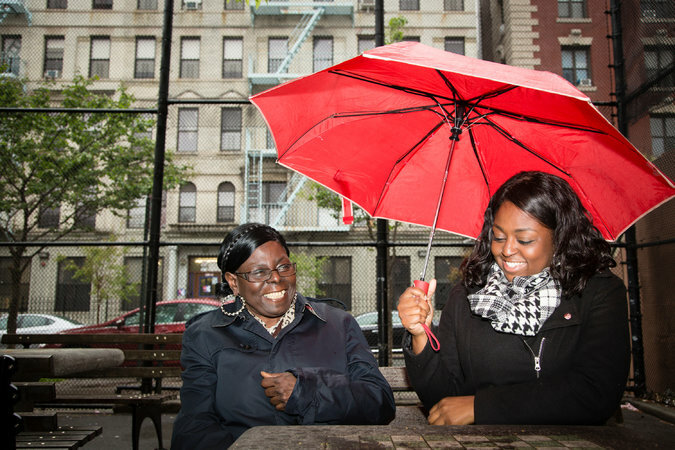 Through our Upper West Side and West Harlem programs, we engage people of all ages and backgrounds." Click here and here to learn more about the GRCC and their rich history! The Harlem Killer Whale College Tour is kicking things off in Philadelphia! We will be performing at the University of the Sciences this Friday, February 21, 7PM. Tickets are $5 for the public and $3/single; $5 for two for the campus community. The show will be held in the Astazeneca Auditorium in the McNeil Science and Technology Center. The school is located at 600 S. 43rd Street, Philadelphia, PA 19104. We hope to see you in the City of Brotherly Love! Please note: We will no longer be performing at Bryn Mawr College on Saturday, February 22. We have added a new location to our 2014 Harlem Killer Whale College Tour! We will be traveling down south to perform Killer Whale at Pensacola State College on Friday, March 28th! This show is at 7PM in the Ashmore Fine Arts Auditorium. It is FREE and open to the public. This will be our first performance in the southern part of the United States. We are officially SOLD OUT for our three shows at the Dwyer Cultural Center! Tremendous thanks to everyone who has purchased a ticket! If you have not purchased a ticket and still wish to attend, you will be placed on a waiting list upon arrival. 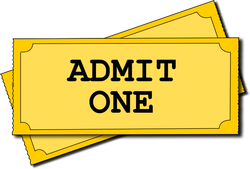 If one of our advanced purchase ticket holders does not arrive by the start of the show, we will seat those on the waiting list in the order in which they arrived. We are only accepting cash at the door. 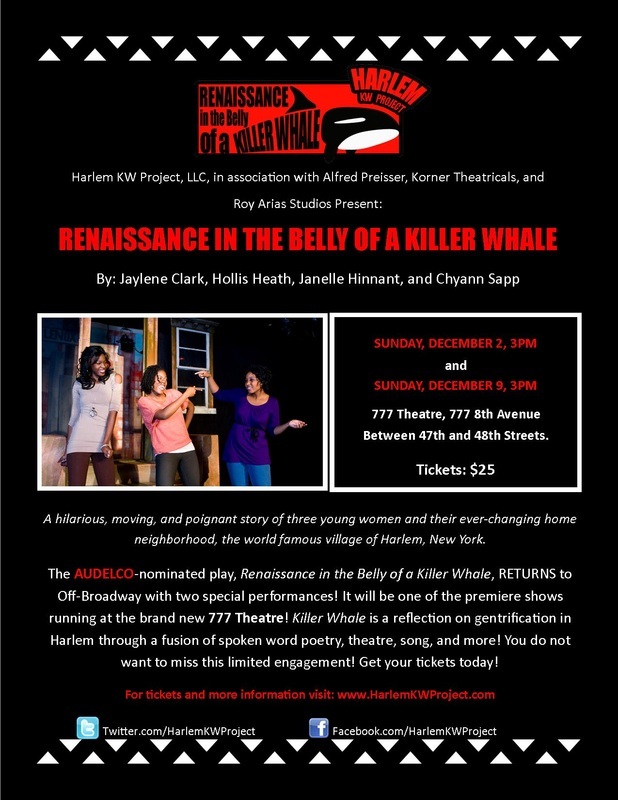 Harlem KW Project, LLC will be performing Renaissance in the Belly of a Killer Whale at Harlem Stage on Wednesday, February 12th, 10:30AM, as part of Harlem Stage's International Series. The International Series is the core education initiative that presents daytime performances from cultures across the globe! We are greatly looking forward to interacting with the students! Tickets are $7 and the performance is open to the public. If you wish to attend please contact us via our Contact page. The Harlem Brewing Company has joined on as one of our sponsors for our Opening performance on Friday, January 31, at 7PM! We are very excited about this because of the connection Harlem Brewing Company has to our show. The Sugar Hill Golden Ale dates back to Prohibition times during the Harlem Renaissance, which we reference in our poem, "133: The Original Swing Street." Learn more about the Harlem Brewing Company here! 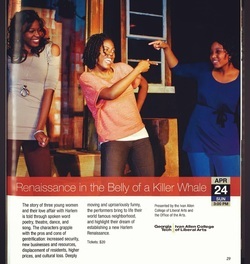 As part of our Harlem Killer Whale College Tour we will performing Renaissance in the Belly of a Killer Whale at Quinnipiac University on Tuesday, February 25th. This performance is not open to the public. Stay tuned for more announcements on upcoming college shows! someone one the waiting list. by the talented, Tiffany Warren, for this performance. Harlem KW Project, LLC is returning to MIST Harlem! 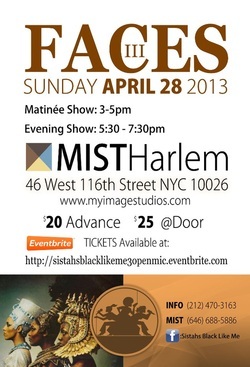 This Sunday, April 28, at 3PM, we will be performing our poem, "Harlem is Here," as part of the opening for the Sistahs Black Like Me event, Faces III. This evening of arts will include an open mic, spoken word, live jazz, and dancing. There will be two performances at 3PM and 5:30PM, but we will only be performing at the 3PM show. Tickets are $20 in advance and $25 at the door and may be purchased here. 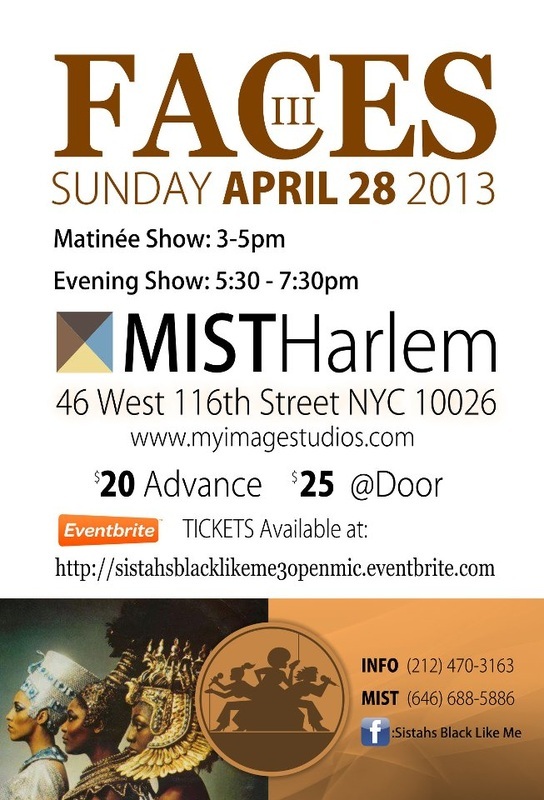 MIST Harlem is located at 46 West 116th Street, between Malcolm X Boulevard (Lenox) Avenue and 5th Avenue. Harlem KW Project, LLC will make their debut at MIST Harlem at the Harlem Arts Festival (HAF) Open Mic Jam Session on Wednesday, March 26, at 10PM! HAF is hosting this event to raise money for this year’s 2013 festival. 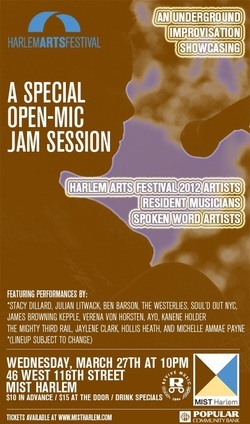 It will feature 2012 HAF Artists, resident musicians, and spoken word artists. We performed in the festival last year. Jaylene and Hollis will be performing two poetry excerpts from Renaissance in the Belly of a Killer Whale. Tickets are $10 in advance, $15 at the door, and there will be drink specials available for purchase all night. MIST Harlem is located at 46 West 116th Street. To purchase tickets visit the Tickets section! This Thursday, February 21, 8PM to 10PM, Jaylene will be featuring at the Columbia University event, Live at Lerner! The event is being held at the Lerner Party Space located on the Columbia campus at 2920 Broadway, New York, NY. She will perform an hour of spoken word poetry followed by hosting an Open Mic. 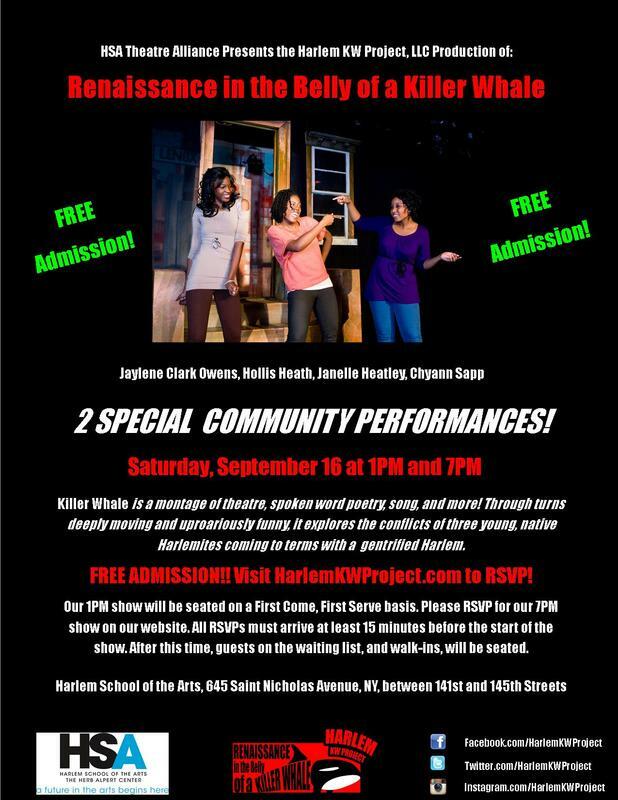 The ladies of Harlem KW Project, LLC will be joining her to perform excerpts from Renaissance in the Belly of a Killer Whale! Bring your energy and bring your poems to share for the Open Mic! This performance is only open to those with a valid Columbia University ID, so if you do not attend Columbia, please spread the word to your Columbia friends! You may join the Facebook event here! Unfortunately we will have to postpone our performance at the Sound View Presbyterian Church that was scheduled to take place tomorrow, Saturday, February 9. The Nor'easter that has begun to touch down in New York City is said to bring heavy snow rates of one to two inches per hour along with possible wind gusts up to 50 mph. The National Weather service has issued a blizzard warning for the five boroughs through 1 p.m. Saturday. Although our performance is at 4PM we believe that it is safer to postpone our performance, especially since many of the attendees are senior citizens. The good news is that we have rescheduled the performance to Saturday, March 9, at 4PM! If you have already purchased your tickets you may use them for our March 9th performance. If you purchased tickets and can no longer attend please email us at info@HarlemKWProject.com so we may arrange your reimbursement. You may still purchase tickets to our March 9th performance by clicking here! Tickets are $25 for general admission, and $20 for students. Tickets may be purchased online via TicketRiver or at the door. 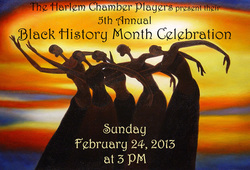 Harlem KW Project, LLC will be performing selections from Killer Whale at the Harlem Chamber Players' 5th Annual Black History Month Celebration on Saturday, February 24, at 3PM! The event will be held at St. Mary's Episcopal Church and will also include performances from violinist Daniel Bernard Roumain, cellist Sujari Britt, and guitarist Thomas Flippin to name a few. St. Mary's Episcopal Church is located in Harlem at 521 West 126th Street between Amsterdam and Broadway. The celebration begins at 3PM! Tickets are $10 for Students & Seniors, and $15 for general admission. To purchase tickets visit our Tickets section. 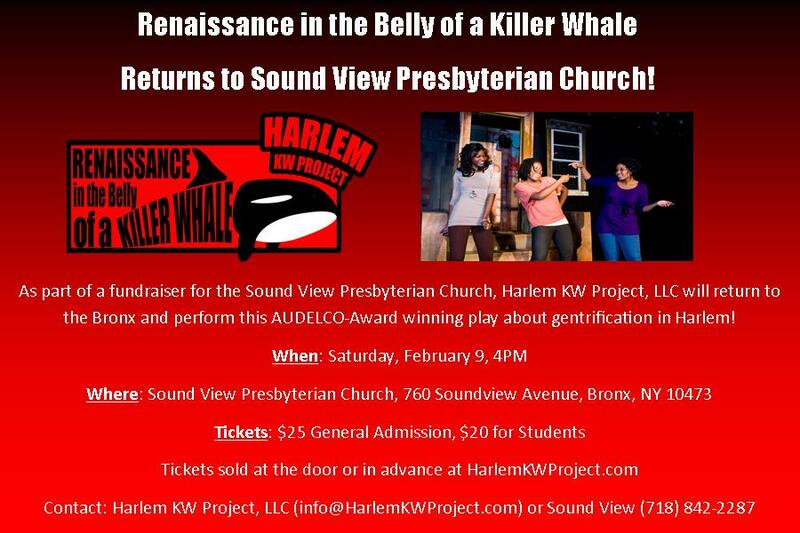 Renaissance in the Belly of a Killer Whale will be featured at the Soundview Presbyterian Church once again! Experience Harlem by taking a trip to the Bronx! We will return to Soundview on Saturday, February 9, at 4PM! Tickets are $25 for General Admission and $20 for Students. To purchase tickets visit our Tickets section or purchase at the door! 15, 5PM to 11PM! If you have any questions please contact us here. 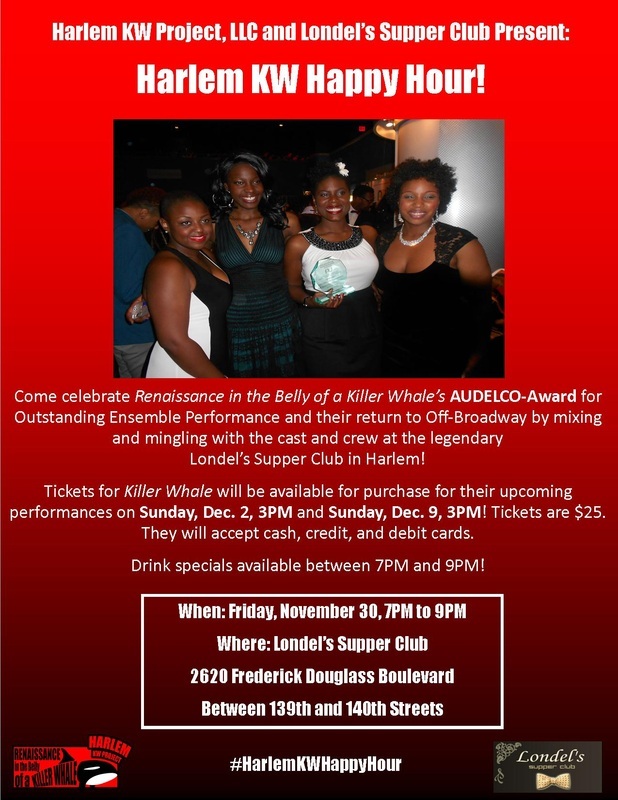 Londel’s Supper Club in Harlem this Friday, November 30, 7PM to 9PM! Tickets for Killer Whale will be available for purchase for our upcoming performances on Sunday, Dec. 2, 3PM and Sunday, Dec. 9, 3PM! Tickets are $25. We will accept cash, credit, and debit cards. Drink specials available between 7PM and 9PM! artists to present so arrive early to catch her! 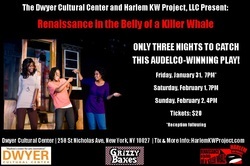 Renaissance in the Belly of a Killer Whale has won the 2012 AUDELCO/VIV Award for Outstanding Ensemble Performance!! We are extremely grateful, honored, and ecstatic about this award! Thank you to all those who have supported us from the beginning! Next stop, our return to Off-Broadway! Click here to purchase tickets! Jaylene Clark is an Apollo Theater Super Top Dog Amateur Night Finalist! She did not win the title of Super Top Dog Champion, but we are very proud of her success and the fact that she advanced all the way to the finals! Thank you to all who came out to support by cheering for Jaylene! We had a blast! Due to Hurricane Sandy the Apollo Theater Super Top Dog Amateur Night competition has been postponed to Wednesday, November 14th, 7:30PM! All those who have tickets for October 31st will be able to present them as tickets for November 14th. If you have yet to purchase tickets please do so by visiting our Tickets section. Let's get Jaylene to that Super Top Dog title! Due to Hurricane Sandy this event has been POSTPONED! We will update you on the future date as soon as that information is available! Balance of Hope and Despair (Redux)," taught by Lynn Roberts. (on the corner of Third Avenue and 119th Street) in Harlem. This website has been updated! There is now a TICKETS section where you can visit to purchase tickets to any of our upcoming shows or appearances! Click here to visit! Renaissance in the Belly of a Killer Whale is returning to the stage! Off the strength of our AUDELCO nomination, Killer Whale will have two guest performances at the new 777 Theatre on Sunday, December 2 and Sunday, December 9, both at 3PM. Killer Whale will run alongside the newly revived play, The Great MacDaddy, for which our very own Jaylene Clark is an Associate Producer and Marketing Team member! To purchase tickets visit the Tickets section above. The arts center, Symphony Space, has just announced that the theme for its 2013 second annual multi-disciplinary spring festival will be “Harlem Resonance!” Throughout the month of April Symphony Space will feature a variety of diverse programs, all featuring Harlem artists. The festival will culminate into their FREE day long Wall to Wall festival, which will take place on May 11th, starting at 11AM at Symphony Space. 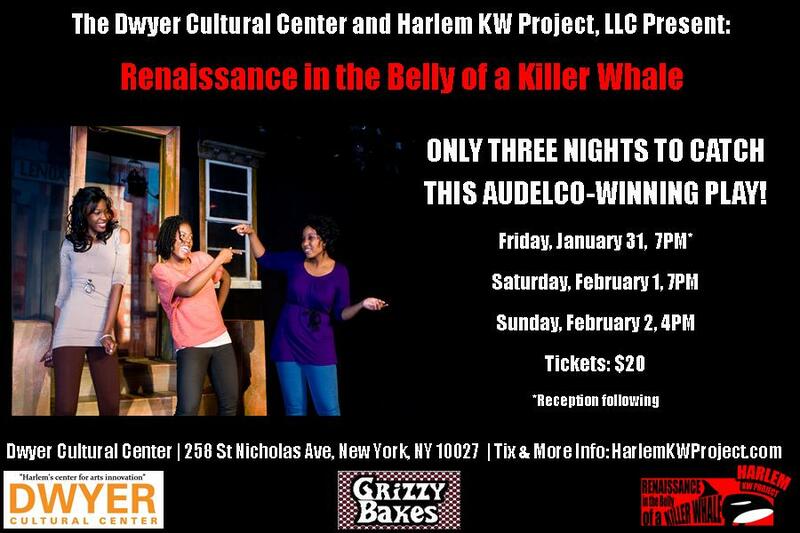 Harlem KW Project, LLC is acting as a traditional Greek chorus during the Wall to Wall event: performing snippets of Renaissance in the Belly Killer Whale in various locations within the festival! Jaylene will be a featured guest on the WHCR Voice of Harlem radio program, Another Perspective, on Friday, October 19th, 5PM! Tune in to 90.3FM (NYC) or watch the interview live by clicking here. This is Jaylene's second appearance on Another Perspective. She and the rest of Harlem KW Project, LLC have truly found a home at WHCR! We are honored to announce that Renaissance in the Belly of a Killer Whale has been nominated for an AUDELCO Award in the category of "Outstanding Ensemble Performance!!" We are extremely grateful to be nominated for such a prestigious award. Past AUDELCO winners have included Denzel Washington, Sanaa Lathan, Eartha Kitt, and many, many more. The "Viv" Awards, named after Vivian Robinson who founded AUDELCO, "are the only formally established awards presented to the Black community." 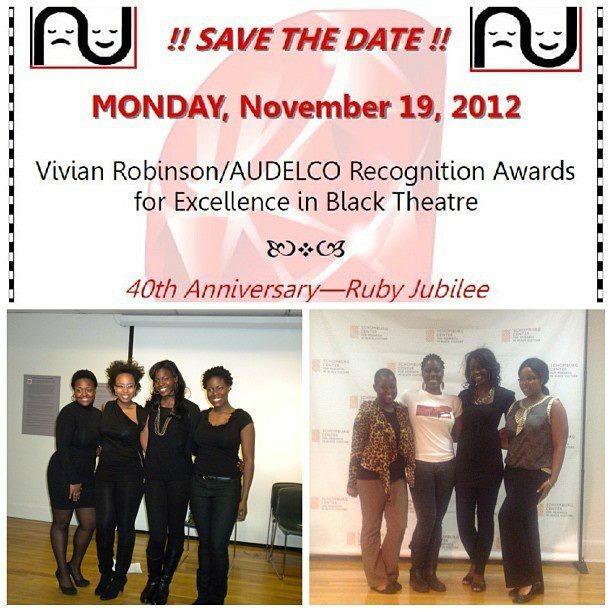 This year the AUDELCO Awards are celebrating their Ruby Jubilee, which is their 40th Anniversary, and we are so delighted and honored that we get to be a part of this special moment in history! For more information visit our blog! Click here for a full list of the 2012 AUDELCO Nominees! and we hope you can attend as many events as possible! Congrats to Jaylene! 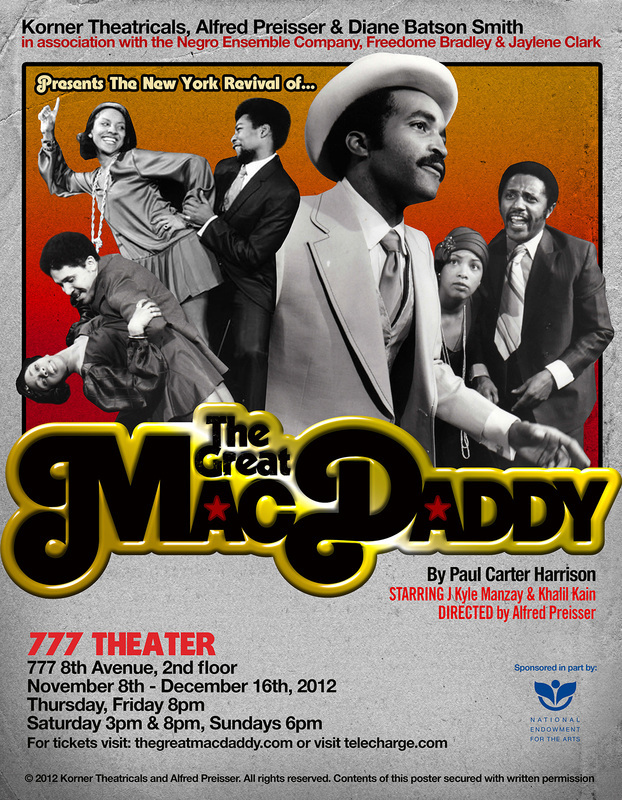 She will be a Producing Associate and a member of the Marketing team for the Obie Award winning play, The Great MacDaddy, written by Paul Carter Harrison! This epic, award-winning play has not been seen in New York since 1977. This will be an amazing revival! To purchase tickets click here and enter the code "jcmacdaddy"! Congrats to Hollis for shooting her first role in a film! She will be seen as Laura in the indie film, Hole in the Wall, which is about a young Mexican immigrant trying to live the American dream in Spanish Harlem. More details on the screening and release of the film to come in the near future. Jaylene will be performing during Harlem Week on Sunday, August 19, around 2PM, on the St. Nicholas Main Stage, which will be located on 135th Street and St. Nicholas Avenue! She is performing two poems as part of "The Apollo Hour" hosted by Billy "Mr. Apollo" Mitchell and featuring performances from select Amateur Night and Apollo Live contestants. This is a FREE event! Janelle will be competing alongside her husband, Jamal Hinnant, in the 2012 McDonald's McCafe Poetry Lounge Finals on Thursday, August 9, at 5PM! Come show your support as she competes against her husband and poets throughout the Tri-State area for $1500! 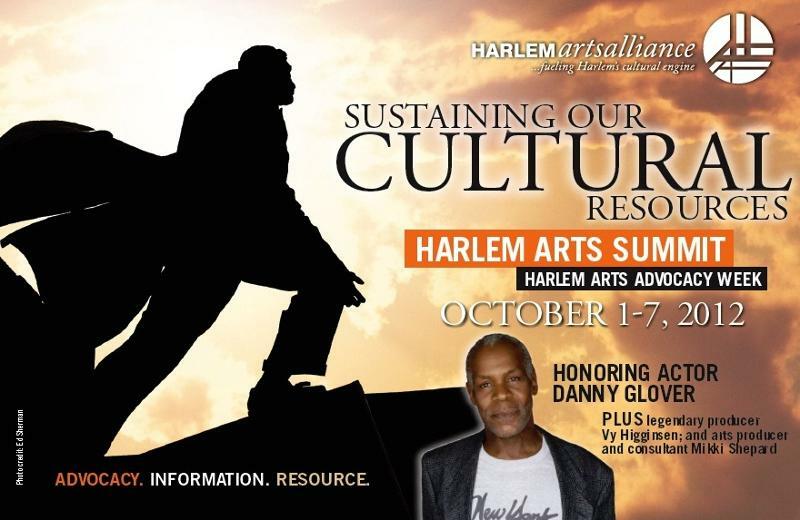 This event will take place in Harlem at the State Office Building, located on 163 West 125th Street. Admission is FREE! 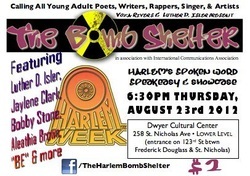 Jaylene will be a featured poet at The Bomb Shelter as part of the Harlem Week edition of this monthly series on Thursday, August 23, 6:30PM! Come out and see a plethora of amazing poets at the Dwyer Cultural Center in Harlem, which is located on 258 St. Nicholas Avenue. Admission is only $2! 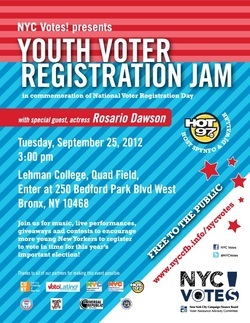 Chyann is organizing, coordinating, and planning the Youth Voter Registration Jam, hosted by Hot 97, taking place on Tuesday, September 25th, from 12PM to 2PM. It will be held at CUNY Lehman College, located at 250 Bedford Park Boulevard West, Bronx, NY. Special guest, actress Rosario Dawson will be in attendance! There will be music, giveaways, and more! This is a FREE event! We are on Instagram! 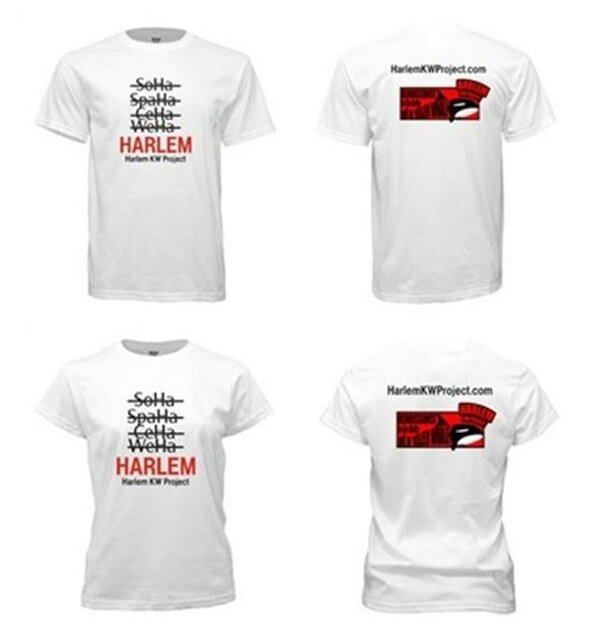 If you are a member of this photo sharing community feel free to follow us at "HarlemKWProject!" Jaylene will be the featured poet at the weekly Open Mic at BusBoys and Poets in Washington, DC! Witness her spit some hot poems on Wednesday, September 12th at 9PM at the 5th and K location (1025 5th Street NW, Washington, DC 20001), which is the same place we performed Renaissance in the Belly of a Killer Whale! Tickets to the Open Mic are $5. Instead of a physical ticket, each person gets a wristband. Wristbands are available for purchase online at midnight prior to the event, and at the restaurant at the Global Exchange Store from 10:00 am until sold out. Limit 4 wristbands per person. Our website received a makeover! Feel free to browse around and check out all the cool new things! We now have a News section, a much cleaner Press/Reviews section, and we have an improved Twitter stream in our Blog! Check it out! Harlem KW Project, LLC has been accepted into the first annual Harlem Arts Festival! 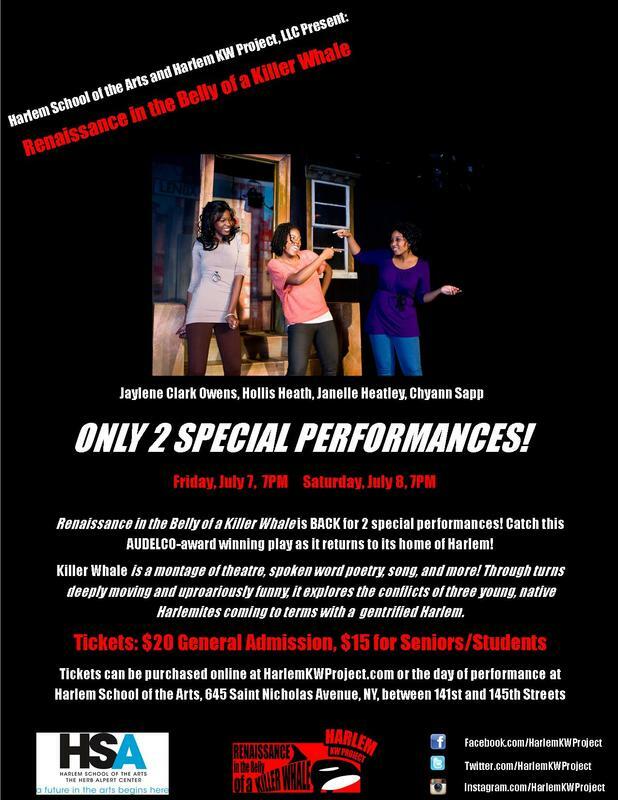 Come out and support these ladies as they perform selections from their play, Renaissance in the Belly of a Killer Whale, as well as perform a special poem dedicated to Harlem called, Harlem is Here. This free festival is from Friday, June 29 through Saturday, June 30. 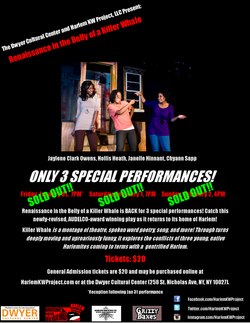 HKWP will be performing on Friday, June 29 at 4:00PM on the Richard Rodgers Ampitheater stage in Marcus Garvey Park! 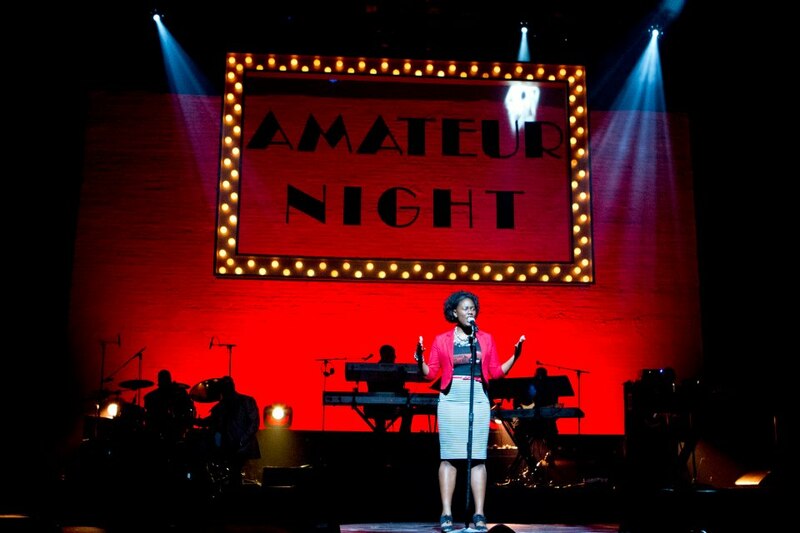 Jaylene won third place at the Apollo Theater Amateur Night: Top Dog Competition on 05/16/12!! Congrats! We will need all of your support on, Wednesday, October 31, 7:30PM, as she competes in the Super Top Dog FINALS where she will compete for $10,000!! Click here to purchase tickets! If she wins the $10,000 she plans to donate a portion to Harlem KW Project, LLC, as well as a portion to supporting the arts in Harlem!